The Classic Jazz Trio - Piano/bass/drums... Straight ahead, funk, and sensitive ballads all carefully placed together on one exciting jazz recording. Cliff Monear has been working as a professional pianist for more than 20 years. A product of the Berklee College of Music – Cliff’s jazz group, "The Cliff Monear Trio", is one of the busiest performing rhythm sections in the Midwest. In addition to this very full private and public performance schedule, and teaching commitments at Wayne State University, Cliff is the exclusive Steinway & Sons representative for the Michigan jazz community. …What gives the music personality is Monear's suave touch, relaxed swing, fresh melodic and harmonic turns and the unpretentious way he draws on familiar influences. Michael G. Nastos - Veteran radio jazz host, WEMU-FM… Professional journalist for the Ann Arbor News, Cadence Magazine as Detroit correspondent, with supplemental credits in Coda, Downbeat, Jazz Times, Arts Midwest, Detroit Jazz Magazine. Cliff Monear is a facile and imaginative pianist, and he lets us know it from "Bernie's Tune." 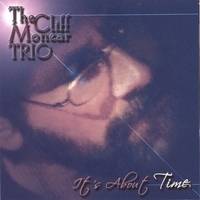 the first track of his new CD, It's About Time (cliffmonear). What's most striking about the CD, however, is the breadth of the compositions Monear chooses. There are offerings by jazz musicians — e.g., Miles, Monk, Coltrane and Freddie Hubbard — but also pop tunes like the 1933 hit, "Temptation," (not the new "Temptation" recently recorded by Diana Krall but the old one played by the Michigan Marching Band). Other tunes on the CD range from "Freedom Jazz Dance" to "Baubles, Bangles and Beads" to "All The Things You Are." Not a bad spread, what? Monear and his bass player, Nick Calandro, play with great skill and feeling. There are three different drummers on the twelve tracks and their contributions are appropriate, their solos, quite thrilling. The CD's title refers to the variety of tempos employed by the group; they certainly do provide diversity. A surprise addition to the tune list is "Melancholy Serenade," the theme song of Jackie Gleason's TV show. Monear plays this with great tenderness, but I doubt that he is old enough to have enjoyed "The Great One's" TV antics. This is a fine CD. It has a quality George Shearing's early small group records had: you can listen to it as serious and exciting jazz, but it also serves as good background music for parties or just a quiet evening. Hazen Schumacher - Former host of the nationally syndicated "Jazz Revisited" radio program. Current Vice President of SEMJA.